My trade was triggered long yesterday at 1.1100 as the pair broke above upward resistance, and everything was looking great until this pesky little “coordinated global rate cut” happened. I was stopped out within an hour as this event whipsawed USD/CAD down 100 pips, close me out, and pushed the pair higher and higher to hit my profit targets…. grrrrr!!!! So, I’m a bit bummed on the bad luck, but my money management plan kept my loss to a very small amount. The US Dollar continues to be the safe haven play in the current environment, and after the global rate cuts failed to spark confidence, I continue to look for long US Dollar opportunities until sentiment changes. Stay tuned! Greetings Friends! 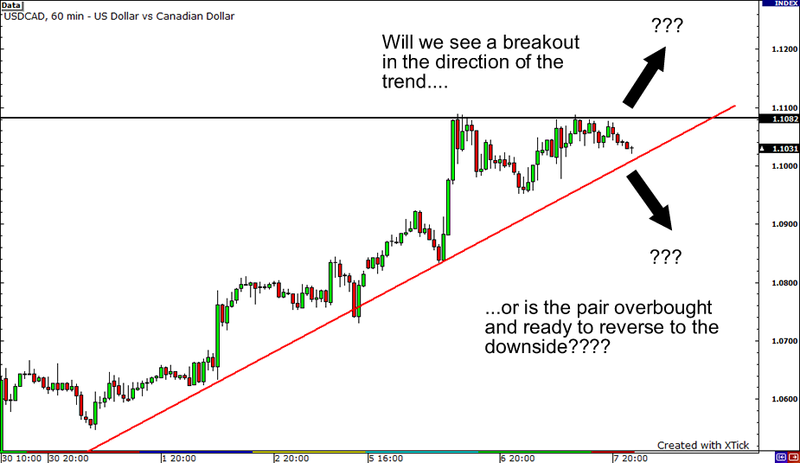 We see a nice chart pattern setup on USD/CAD as the pair consolidates after a nice trend higher. Are we about to see a breakout higher or is the rally out of steam? If one order does get triggered, I will cancel the opposite long/short order. We do have event risk with housing data from both the US and Canada at 830 am EST, so please be very cautious in the morning US session. Stay tuned!